Android OEMs from China prefer to skin the operating system in their phones. Their primary customers are Asian, and the trend of theming the appearance of the phones is at large here. Major Chinese smartphone vendors often try to replicate the design language of iPhone. Rear camera placement or the introduction of notched display are some of the examples of physical characteristics modeled after Apple’s depiction. On the software front, skins like EMUI from Huawei/Honor, MIUI from Xiaomi or ZUI from Lenovo/ZUK have one thing in common: the iOS-esque app drawer less design. The default launchers of these OEM skins tend to ditch the app drawer functionality of stock Android and put app icons on the homescreen. Replacing the launcher is quite easy in Android ecosystem. One can search in the Play Store and install a new launcher just like a regular app. Well, OEMs like Huawei went one step further and started blocking third party launchers on some of their phones. However, there is no another side of the story. POCO, Xiaomi’s sub brand, introduced a separate launcher named POCO Launcher along with their first phone, Poco F1. The app drawer is one of the notable inclusions in that launcher. Clearly, the phone targets global audience who are more accustomed with stock Android’s home button/dock+app drawer combo. Realme, a (now independent) subsidiary of OPPO, seems to follow the same trend. Unlike their parent company, Realme promised bootloader unlocking facility for their phones. In fact they started the initiative with Realme 2 Pro which helped to kickstart aftermarket development. Realme phones run ColorOS, which is the skinned version of Android produced by OPPO. The absence app drawer is intended, but it frustrates a lot of users. The Shenzhen cased company is planning to expand to more global markets, and the current software design may not to adequate to satisfy consumers. From the verbatim of Madhav, it sounds like the app drawer will be an optional choice. 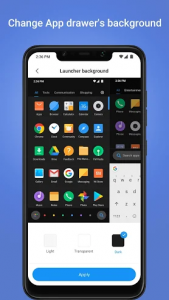 The default launcher may get more customization options besides the app drawer across all devices. Current Realme phones run ColorOS 5.2 based on Android 8.1 Oreo. Pie update is promised by the company in Q1/Q2 of this year. Recently the community spotted a Geekbench listing of Realme 2 Pro running Android 9. It is not hard to speculate that Realme/OPPO is currently performing internal tests on the updates. Stock vs. 3rd party launcher – what’s your choice? In the 11th episode of Realme Community FAQ, the company once more confirmed about the arrival of app drawer in upcoming ColorOS 6. Q. 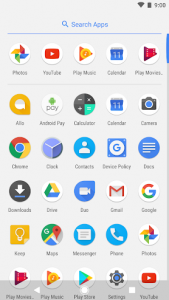 Will ColorOS 6 provide the option to enable the app drawer? A. Yes! This has been highly requested and we are thrilled to announce that you will be able to turn on the app drawer in the settings.